One of the first fun things we wanted to learn about was Tecumseh. Before heading there, we heard that midshipmen give them offerings with the hope of answered prayers for things like passing tests, and winning sporting events. They even paint his face and dress him up. So we set out to get the "correct" story, as well as visit the old man in person! This was from the Annapolis Government website: This monument features Tamanend, also known asp Tecumseh, Chief of the Delaware Indians from 1628- 1698. In 1817 artist William Luke carved Tamanend’s likeness in wood for the figurehead for the USS Delaware. The ship was salvaged in 1866. In 1930 the carving was cast in bronze at the US Navy gun factory. It sits on a granite base in front of the world’s largest dormitory, Bancroft Hall, where Midshipmen give penny offerings for passing grades and routinely decorate the statue for major Navy sporting events. And from the Public Affairs Office: The figurehead called "Tecumseh" has, for many years, played a prominent part in the traditions of the United States Naval Academy at Annapolis, MD. The original wooden image was sent to the Naval Academy in 1866 after being salvaged from the wreck of the old ship of the line "Delaware," which had been sunk at Norfolk during the Civil War to prevent her from falling into Confederate hands. 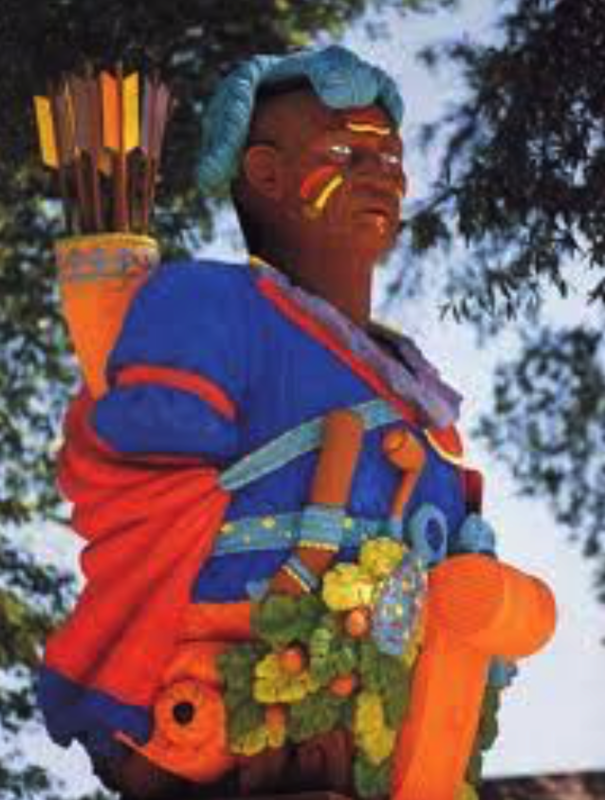 The builders of the "Delaware" intended the figurehead to portray Tamanend, the great chief of the Delawares, a lover of peace and friend of William Penn. But to the midshipmen of the period, there was nothing in the name of Tamanend to strike the imagination. The effigy was also known by various other names -- Powhatan, King Phillip, and finally Tecumseh -- a great warrior and thus heroic and appropriate to the midshipmen. For 40 years, the wooden figurehead kept its stern vigil in the Yard at Annapolis until the winds, sun and rain began to take their toll. In 1906 a face-lift with the aid of cement, putty and paint temporarily removed the signs of age. When the ravages of the weather again threatened, the Class of 1891 raised a fund to immortalize the old fellow in bronze. The delicate task was accomplished at the U.S. Naval Gun Factory. To ensure that the bronze figure would lose none of the potent power with which the midshipmen had endowed the old figurehead, the wooden "brains" and "heart" of the ancient Indian were transferred to the bronze statue. In the spring of 1930, the statue, mounted on a pedestal of Vermont marble adorned with the Naval Academy seal, was erected on its present site from which the grim old warrior gazes eternally toward the main entrance of Bancroft Hall, the midshipman dormitory. Tecumseh has become not only the "God of 2.0" -- the passing grade point average at the academy -- but also the idol to whom loyal midshipmen give prayers and sacrificial offerings of pennies. Midshipmen offer a left-handed salute in tribute to Tecumseh, and they toss pennies his way for good luck in exams and athletic contests. Each year, Tecumseh is decked out in a coat of "war paint" for Parents' Weekend in August, Homecoming in the fall, before Army-Navy contests and for Commissioning Week. When we went to go visit, poor Tecumseh was covered up. We were a little saddened that maybe they were working on him, but then further investigation showed we were visiting right before Parents Weekend (which is the first weekend parents of Plebes get to see their kids after dropping them off weeks before). So maybe this was an attempt at covering his new outfit before they get here. It was pretty awe inspiring to be in the presence of something with such great history and significance.